The double-word "action-puzzler" has been thrown around for a couple of times already, so it's time to elaborate on that. You control a face icon on a grid of turnable and connectable pipe-like blocks, and your job is to get all the blocks connected to each other. To make this into more of a challenge, the game designer has included enemies (not included in the first couple of levels) and a time limit. You start with a 3x4 grid of pipes, and after every two or three levels or so, the size of the grid changes, the number of enemies increases, the game speed goes up, and/or the grid gets shuffled in an increasingly tricky manner. In other words, it feels like a mix between Locomotion and Pipe Dream, but Zenji has a more immediate feel to it, in a way. If you're not into puzzle games in general, Zenji might be one of the few exceptions to the rule, since it's more about your own movement and avoidance of enemies than simply getting the puzzles solved, which on its own would be stupefyingly boring. With all the right elements in the mix, Zenji manages to be an exhilirating experience, and an exception to the rule of puzzle games requiring too much thought. Highly recommended. Luckily for me, most of Zenji's versions play very similarly. Only the Atari versions feel a bit slower compared to every other version, but the speed issue can be addressed by switching from PAL to NTSC, if you're using an emulator. If you absolutely feel the need to add loading times to the accessibility of the game, then I would hazard a guess you've got a problem with computers in general. In any case, only the C64 and SPECTRUM versions had tape releases, and the SPECTRUM version is the only one that was ONLY released on tape. But we're not going to take all that into account in the actual playability comparison. As the game instructs you, if you care to wait for a few seconds in the title screen to get to the automatically shown instructions bit, you need to colour up the whole maze by connecting all the pipe pieces to the source - the point which you start each level from. Keeping the fire button down and moving the joystick left or right will turn the pipe you're currently on 90 degrees to the chosen direction. Your only enemies are roaming flames, which will shoot sparks at you, but you can dodge them by turning the pipe in such a way as to disconnect it from the direction the sparks are coming from, or just simply move into another pathway. Sometimes, you will see numbers going down on some pipe bits, which you need to collect to get bonus points based on the number you collect. If the number goes down to zero, the pipe will disappear and so will a small bit of your end level bonus points. The only special things you need to be aware of regarding any specific versions of Zenji is really the controls. Most versions can be played simply with just a joystick, but for example, the ATARI versions require you to press the START key from your keyboard (F2 on emulators), C64 goes with F1 instead, and the COLECOVISION controller only uses one fire button and the joystick, while the keypad can change the difficulty level from the title screen. Game options can be chosen from either the OPTION key on the ATARI, F3 on the C64 or any dial on the numpad of the COLECO controller. Also, in the SPECTRUM version, the game makes you choose your preferred control method the first thing after loading the game, then you choose the number of players by pressing 1 or 2 on your keyboard (the game doesn't tell you that, though). Also, as the control instructions screen tells you, Symbol Shift + Enter resets pretty much anything: it goes back to the title screen from the game, and it also goes back to the control options from the title screen. To be honest, there is not one thing that really grinds my gears in any of the versions' gameplay. They're all similar enough not to require giving any minus points for something that isn't really that important. So, let's just celebrate this occasion by giving all six versions a shared spot. That already gives you a fairly good idea, that playing Zenji on any chosen platform will be a solid experience. As simple as Zenji's graphics are, there still are a fair amount of differences - if not in all six, then at least there are four notably different versions. The two ATARI versions look basically the same, although there are some colour differences in the PAL and NTSC versions, as you will see from some of the screenshots below, and the COLECO and MSX versions look exactly the same. Loading screens from Commodore 64 (left + middle) and ZX Spectrum (right). We shall start with loading screens, where available, since we skipped that part again. As I mentioned earlier, only the C64 and SPECTRUM versions had tape releases, so naturally, only those two have loading screens. In the SPECTRUM loader, the game logo looks like it's made from those foldable snake toys that you can find with various names, such as Magic Ruler or Speed Cube Twist Snake or whatever. In the Activision release of the C64 version, the game title is only shown as a bit of large text in the same font as all the rest of the text on the screen, while in the Firebird re-release, there is an actual game logo, which looks nothing like either the SPECTRUM loader logo or either of the cover art title logos. Seems like they didn't really bother to decide upon a constant logo. Well, as long as the Activision logo is traditionally huge, everything else is secondary. The C64 Firebird re-release got the Firebird logo rather nicely on display, though. Atari 5200/800, Commodore 64, MSX/Colecovision, ZX Spectrum. 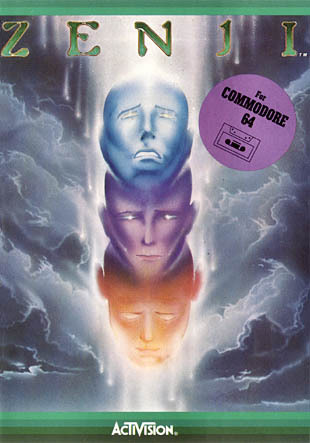 Once the game has finished loading, you are in most cases greeted by the "official" game logo, as was designed by Matthew Hubbard for the ATARI original. Even the MSX and COLECO versions show the same logo, albeit in a squeezed manner due to the graphics mode used by both machines. Only the SPECTRUM version doesn't have the logo shown in the beginning (I suppose the loading screen was made to suit the purpose), but instead, you get a control options screen. The above screens are compiled for the purpose of being more compact - the actual instruction screens are shown sequentially, one piece of instruction at a time, to fill a certain space on the screen, in the order shown above. The only real difference of importance here is, that in the SPECTRUM version, none but the number countdown is animated, while in all the other versions, all items are animated to do something they would be doing when the game is on. Added to all that, each screen features the text scroller at the bottom of the screen, which includes the copyright, the Activision logo (in colour where available) and the appropriate credits. After all this has passed, the High Scores table is shown, which you will see at the end of this section, just for the sake of balance. Being a puzzle game rarely requires all that much from graphics - the only important thing is to be functional, so that the game is as easy to play as it needs to be. Taking that into consideration, the focus is now on the colours, rather than animations and details. And as we can see from a quick look through all the four main versions, there is not very much of detail we can focus on, and the detail is really all in the colours. First of all, the colour from the Source, spreading into the pipes as you connect them to each other. It doesn't look like much of a thing to focus on, but one could argue that this has some relative importance to the game's philosophical whatsoever. In the original ATARI version, as well as the C64 and SPECTRUM conversions, the colour is animated to rearrange itself all throughout the connected pipes (connected, NOT the source pipe) whenever you turn a pipe that's at a key spot, either connecting more of the Source colour or disengaging a section from the Source. In the MSX and COLECOVISION versions, nothing gets redrawn or recoloured, and only the bits that will be affected will be affected without any visible effect. Is that a good or a bad thing? Who knows, but it's an effect that requires some thought. Second, the first two puzzle sizes only allow for one Flame creature - and even then, only in the second size. For the sake of convenience, though, I shall now make note of a second Flame creature entering the stage when you get to the third puzzle size, as you will see in the below screenshots. In action, you would see that the Flame's "hair" is animated to wave separately from its "head" turning animation, at least in the original version. This has been translated well into the C64 version, but the colouring of the flames is less pompous there. At least they're both still multi-colour, and differently coloured, too. The MSX and COLECO versions have two differently coloured monochrome sprites for the Flames, and their animation is less complex. The SPECTRUM version has similarly less complex animations as the other two monochromes, but both Flames are green, because... why? I don't know. Green is the other colour used for the grid containing all the pipes, and red is the other, so seeing as a flame would feel more natural as red, then the choice of colour must have been due to some other heavy reason that I don't understand. Which is still a bad excuse, since the green Flames are not nearly as visible on the yellow pipes as red would be, and there's still some visible colour clash. Already we have a rather clear sense of what the order is going to be here, but I've got a couple of more details to focus on, which might or might not have any bearing on the scores. The Face, which is the thing you control, is white with red and blue stripes on the top and bottom in most versions. In the SPECTRUM version, it's another monochrome thing, oddly coloured purple. At least the Face is animated to roll in all four directions similarly in all versions, but it doesn't look more than a bit of a mess on the SPECTRUM due to the monochrome style, but also because the animation is notably faster than in the other versions. If you can consider that a good thing, I applaud your eyesight. But to me, the MSX/COLECO version of the Face looks the best, even in its relative lack of colour, because it combines what's best in all the other versions. One more odd thing of note, since we're running out of anything important to say regarding graphics: in the MSX and COLECO versions, the biggest mode of the puzzle is 7x6 (7 wide and 6 high), instead of 6x7, as they are in all the other versions. Probably because of the screen mode allowing such alteration, and I can't really say, whether it has any difference in gameplay. If anything, the MSX/COLECO screen mode looks probably the most comfortable for most gamers that haven't played with wide-pixeled graphics before. But it can be considered a matter of taste. Here's something I wanted to include merely for the sake of being thorough. Of course, this is an occurrence that happens in many Atari games, for whatever reason, that some of the colours are a bit different in PAL mode than in NTSC mode. In the case of Zenji, the yellow bits turn sort of pinkish, and the blue bits lose some of their sharpness. It's not a problem as such, just some slight differences that don't occur on other machines. Nothing more to see here, really. It's basically just the same old High Scores table model that you would see in 99% other games. Three letters for an entry, and the only graphical effect of note is the differently coloured letter you're currently choosing - except in the MSX and COLECO versions, the current letter is blinking, and in the SPECTRUM version, it doesn't even do that. Perhaps if you really want to find something different, it's the presence or absence of the Activision logo/scroller at the bottom of the screen. One could argue that Zenji doesn't have much of a soundtrack, although for the time of release, it must have been more than enough - but the little it does have is instantly recognizable, which is more important. There is a certain reoccurring element of Japanese-style harmonics in all the game's tunes, that renders it unmistakable, no matter which version you're going to hear. Although I said "all" the game's tunes, there are only two actual, properly constructed tunes in Zenji - the main title theme, which lasts for about four full measures of 4/4 at 220 beats per minute (and is played also when you lose a life); and the in-game tune, which loops after eight measures. The third "tune" is reserved for the counting of bonus points, which is a very brief loop that goes on until the bonus points are counted, and it is constructed slightly differently on the ATARI compared to the other two main contestants. In the ATARI version, the loop contains thirty-two of 32nd-notes at a slightly more leisurely pace than the other music. In the MSX, COLECO and C64 versions, the bonus counter is made of sixteen staccato 16th-notes instead. Musically, there's nothing particularly wrong about any of the above versions. It's just that the natural pitch for certain notes produced by the ATARI computers' POKEY chip are not always completely in tune, making most games sound a bit off. Perhaps it can be considered a desired effect in some cases, but here, I cannot honestly call it a desired effect. In addition to the music, there is only one sound effect that I can think of: the sequence of six short staccato notes when picking up a countdown bonus score. In most of the above cases, it's the same, but in the COLECO version, the notes are oddly rearranged, though it matters little. As for the thus far absent SPECTRUM version, there is no main title tune, as the title screen has no music. The in-game "tune" is a completely foreign loop of 10 quick staccato notes that have no bearing on the original melody or even the harmonic principle. Even when you lose a life, the short 8-note ditty is something more sinister and unfamiliar of tone, compared to the other versions. And that's all the "music" you're going to hear in the SPECTRUM version, since the bonus counter noise is just a basic bonus counter noise that only repeats one single high-pitched note as quickly as necessary. But consider that a sound effect instead, and you get one more sound effect than in the other versions - although then again, picking up a countdown bonus only results in a quick sprint of a few similar quick notes as in the end-level bonus counter bit. Sure, you cannot expect a 48k SPECTRUM to perform magic, particularly in games of this age, but one would at least have hoped to hear something akin to the original tunes. Yeah, now that I see the results, I have to admit it was not a very sensible choice of a game for doing a comparison of. But it's a fun game worth playing on any platform. Even the Spectrum, even though the results may look a bit dreary, but remember: they're only comparatively dreary. Zenji became Matthew Hubbard's biggest original title, but then he wasn't very long in the game industry anyway. Previously, he only designed and wrote a game called Dolphin for the Atari 2600. Apart from that, his work consisted of programming pre-conceived ideas and conversions, such as Submarine Commander (based on Midway's Sea Wolf) and Double Dunk (a two-on-two basketball game) - both for the Atari 2600, as well as Defenders of Dynatron City for the NES and Road Rash II for the Sega Megadrive/Genesis. 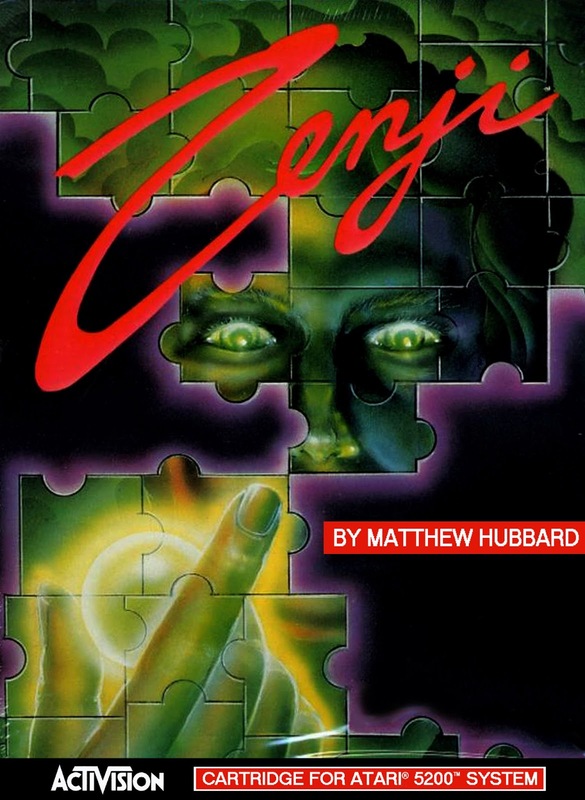 It's a pity, though, that Zenji being his most original and beloved game is still such a little known one, so let's hope this article will help more people discover it. Thanks for reading, hope you enjoyed it! Next time, we go back to the arcades one last time with a co-operative two-player game, which will effectively be the last article co-worked with my occasional partner SJ. See if you can guess what it is. Until then, pip-pip! 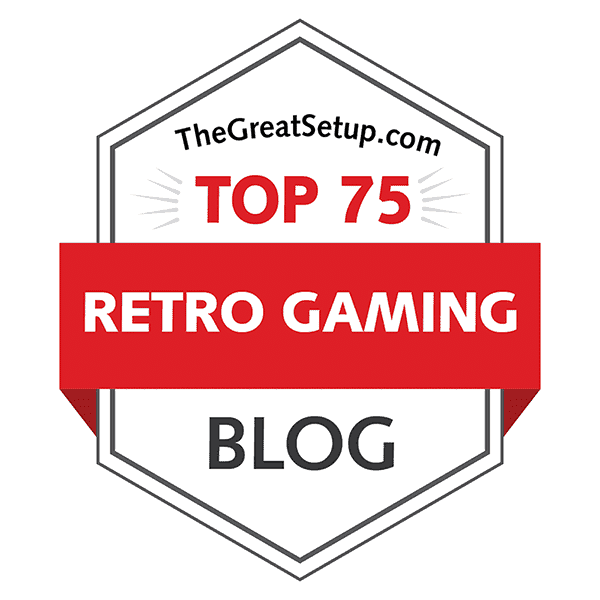 Nice post about the Zenji game. God Bless You.